The 2017 Russian Grand Prix (officially the 2017 Formula 1 VTB Russian Grand Prix) will be the fourth race of the 2017 Formula One season, and the fourth Russian Grand Prix to be held on the Formula One calendar. It will be held between 28 April and 30 April 2017. In qualifying, Sebastian Vettel took his first pole position of 2017, also his and Ferrari's first pole since the 2015 Singapore Grand Prix. He was joined on the front row by the other Ferrari of Kimi Räikkönen, marking the first time both of Ferrari's cars qualified on the front row since the 2008 French Grand Prix, while Mercedes drivers Valtteri Bottas and Lewis Hamilton qualified on the second row. Renault No Time 20 DNP 22 ! DNP 22 ! * Sainz was given a three-place grid penalty for colliding with Stroll in Bahrain. † Vandoorne was given a fifteen-place grid penalty for using his fifth MGU-H and turbocharger. Sebastian Vettel and Ferrari's first pole position since the 2015 Singapore Grand Prix. First time neither Mercedes starts on the front row since the 2015 Singapore Grand Prix, and for the first time at the Sochi Autodrom. First time Ferrari has a front row lockout since the 2008 French Grand Prix. First time Kimi Räikkönen starts on the front row since the 2015 Italian Grand Prix. ↑ "2017 Formula 1 VTB Russian Grand Prix". formula1.com. Formula One Administration. https://www.formula1.com/en/championship/races/2017/Russia.html. Retrieved 30 April 2017. ↑ "2017 Russian Grand Prix – Practice 1 results". Formula1.com (Formula One Administration). 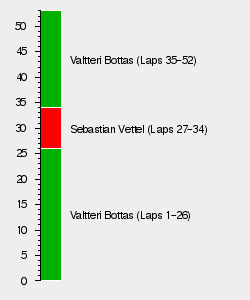 28 April 2017. https://www.formula1.com/en/results.html/2017/races/962/russia/practice-1.html. Retrieved 28 April 2017. ↑ "2017 Russian Grand Prix – Practice 2 results". Formula1.com (Formula One Administration). 28 April 2017. https://www.formula1.com/en/results.html/2017/races/962/russia/practice-2.html. Retrieved 28 April 2017. ↑ "2017 Russian Grand Prix – Practice 3 results". Formula1.com (Formula One Administration). 29 April 2017. https://www.formula1.com/en/results.html/2017/races/962/russia/practice-3.html. Retrieved 29 April 2017. ↑ "2017 Russian Grand Prix – Qualifying results". Formula1.com (Formula One Administration). 29 April 2017. https://www.formula1.com/en/results.html/2017/races/962/russia/qualifying.html. Retrieved 29 April 2017. ↑ 6.0 6.1 "Carlos Sainz gets grid penalty for Lance Stroll clash". 16 April 2017. http://www.eurosport.com/formula-1/bahrain-grand-prix/2017/carlos-sainz-gets-grid-penalty-for-lance-stroll-clash_sto6132761/story.shtml. Retrieved 30 April 2017. ↑ 7.0 7.1 Anderson, Ben. "F1 Russian GP: Vandoorne gets McLaren's first 2017 grid penalty". autosport.com. http://www.autosport.com/news/report.php/id/129197/vandoorne-gets-russian-gp-grid-penalty. Retrieved 30 April 2017. ↑ "Russia Grand Prix 2017 Race Results". formula1.com (Formula One Administration). 30 April 2017. ↑ 9.0 9.1 Collantine, Keith (30 April 2017). "2017 Russian Grand Prix championship points". F1 Fanatic (Keith Collantine). http://www.f1fanatic.co.uk/2017/04/30/2017-russian-grand-prix-championship-points/. Retrieved 14 June 2017.